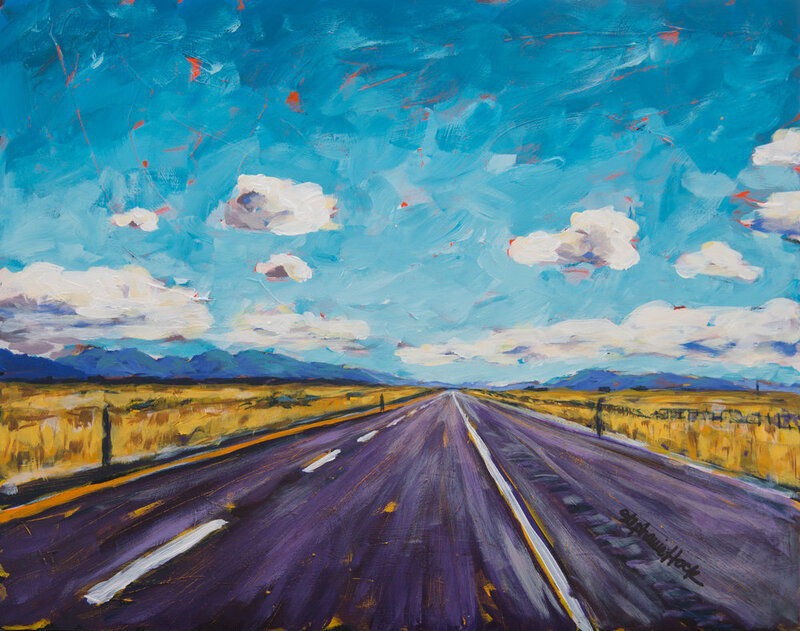 ["Open Road II" 16x20, available] Summer is often filled with road trips for us, and this year has been no different. I find that I'm often filled with two strong emotions as we get out on the open road. Excitement and anticipation for the adventure that's ahead of us, mixed with appreciation for how beautiful the journey is to get there. It's rarely without bumps along the way, but I enjoy so much that I would've missed if I was in too big of a hurry. I think of so many big moments in my life that have felt this way-- graduating high school, moving to college, starting new jobs, getting married, having babies. But I've felt it in smaller moments too, like when I set professional goals for myself and feel excited to see what I can do next and grateful for the little ways I'm learning to be a better artist. Like yesterday, practicing exactly how much paint I load up in my brush and remembering to refill sooner to get deeper, juicier strokes. There is always something to get better at. It's such a long road, but I love traveling down it, and I'm better for every mile further that I go.